This edited volume presents fresh empirical research on the emerging outcomes of China’s law reforms. The chapters examine China’s ‘going out’ policy by addressing the ways in which the underpinning legal reforms enable China to pursue its core interests and broad international responsibilities as a rising power. The contributors consider China’s civil and commercial law reforms against the economic backdrop of an outflow of Chinese capital into strategic assets outside her own borders. This movement of capital has become an intriguing phenomenon for both ongoing economic reform and its largely unheralded underpinning law reforms. The contributors ask probing questions about doing business with China and highlight the astonishing escalation of China’s outbound foreign direct investment (OFDI). 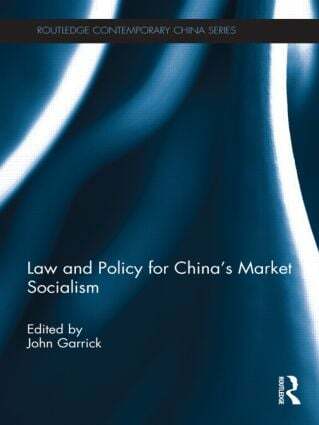 Law and Policy for China's Market Socialism includes contributions from leading China-law scholars and specialist practitioners from the People’s Republic of China, Hong Kong, the United States, the United Kingdom and other countries who all extend the examination of powerful influences on China’s law reforms into new areas. Given the forecast for the growth of China’s domestic market, those wishing to gain a better understanding and seeking success in the world's most dynamic marketplace will benefit greatly from reading this book. This book is essential reading for anyone interested in Chinese economics and business, Chinese Law, Chinese politics and commercial law. John Garrick is a solicitor of the Supreme Court of New South Wales and former judge’s associate of the Supreme Court. He is currently Senior Research Fellow at MGSM and convenor of the Business Law and Corporations Law programs at Macquarie University, Australia.